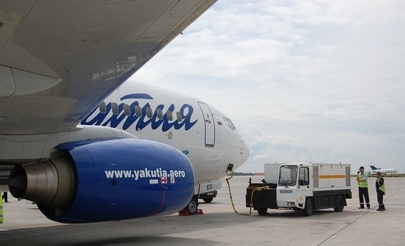 Seven months after the maintenance arm of Yakutia Airlines – Yakutia Technics – obtained an OTAR Part 145 certificate from the Bermuda Department of Civil Aviation (BDCA), the Bermudan aviation authority has issued the Russian carrier with an OTAR Part 39 Subpart F.
In late July 2015, a BDCA delegation led by Head of Airworthiness Alain Coutu, audited Yakutia’s maintenance base Yakutia Technics, the leading such facility in Russia’s Far East region, to see if it is capable of maintaining Boeing 737-800 and Bombardier Q300 airworthiness independently and continuously. Based on the results of that inspection, the BDCA on September 28 granted the carrier a two-year OTAR Part 39 Subpart F certificate. Yakutia Technics began providing independent and continuous maintenance on 737-800s and Q300s on November 1. Previously, Yakutia would subcontract Moscow-based Airways Technics for MRO work on these types. “This is the first time we have obtained an OTAR Part 39,” says Yakutia Technics head Valentin Sleptsov. “We currently provide airworthiness maintenance services on one Boeing 737-800 and one Bombardier Q300. In accordance with the standing plan, we will be taking over one aircraft per month from the [Moscow] provider. Independent airworthiness maintenance of [the parent company’s] four 737NGs and three Q300s will save us over $50,000 monthly.” In the first or second quarter of 2016, Yakutia is planning to have its OTAR Part 39 extended to cover Boeing 737-700s and Q400s. The carrier has no immediate plans to launch in-house maintenance of its single Boeing 757-200 freighter. Yakutia Technics is also working to expand the scope of the OTAR Part 145 certificate it obtained in March 2015. The company currently offers line maintenance services on Boeing 737NGs and Boeing 757-200s. “We are planning to have the certificate extended in late 2015 or early 2016 to cover the Q400, and subsequently the Q300,” Sleptsov says. “Then we will consider the possibility of offering in-house scheduled maintenance work on these types.” Yakutia’s long-term plans include introducing its quality management system at the Khabarovsk-based Q300/400 line maintenance station. At present, line maintenance of the Khabarovsk- and Yakutsk-based aircraft of these two types is provided by the Dutch specialist Samco.